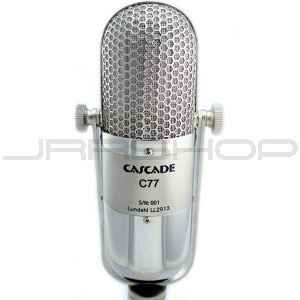 Visually, the C77 is reminiscent of classic ribbon microphones of the past but with a twist. Here at Cascade we have been listening to customer feedback and have designed our premium series of microphones to meet the wants, needs, and desires of all studio users while still keeping our products at an affordable price. The C77 comes fitted with a Lundahl LL2913 transformer mounted on a custom PC board, along with Evidence Audio solid-core copper wire and a Chicago Switchcraft XLR connector. The C77 features a symmetrical ribbon design and is assembled at the Cascade Lab located in Olympia, WA. We feel Cascade Microphones has raised the bar with the C77 by combining premium components with a superior finish at an affordable price point that is attractive to both the seasoned studio veteran as well as the home recording enthusiast.